While 2015 was extremely good to me, I must admit that towards the end of the year - things began to go downhill pretty fast. I was in a psychologically violent relationship, a job that was mentally exhausting and an unhealthy home environment. I would work in tears, return to a home that was more like a prison and look for support from my partner but received abuse instead. I had completely, and utterly lost who I was and had become unrecognisable to my friends and my self. So I booked a last minute plane ticket to Thailand in a desperate bid to rescue myself. I decided on a two week rescue plan and had arranged to meet a few girls I knew who were already in the country. I visited Bangkok, Chiang Mai, Phuket, Koh Phi Phi and Koh Phangan. I had lost a stone in weight for no apparent reason - my eating habits had not changed and I had even made a conscious effort to eat more. I had also stopped going to the gym. 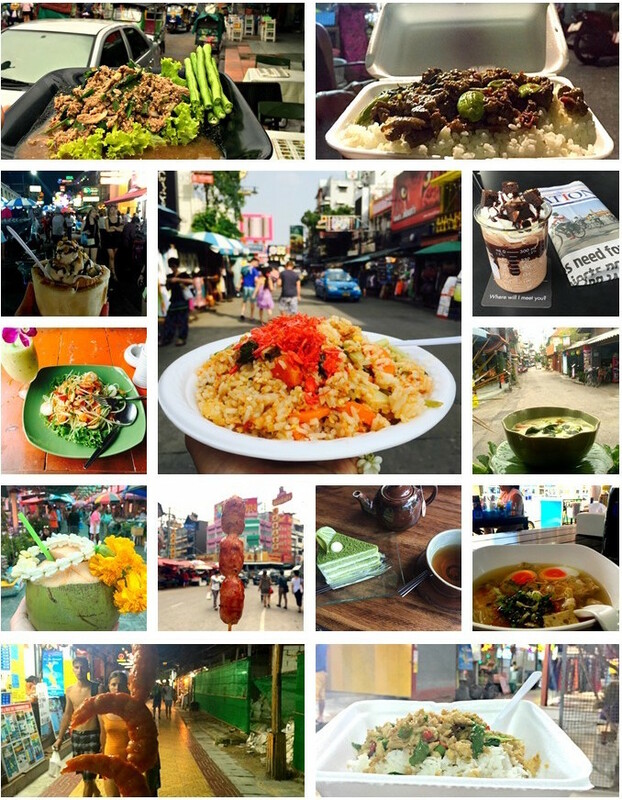 With this in mind, I decided to pursue one of my biggest passions; food, as much as I could while in Thailand. I visited Bangkok twice for a total of 3 nights. 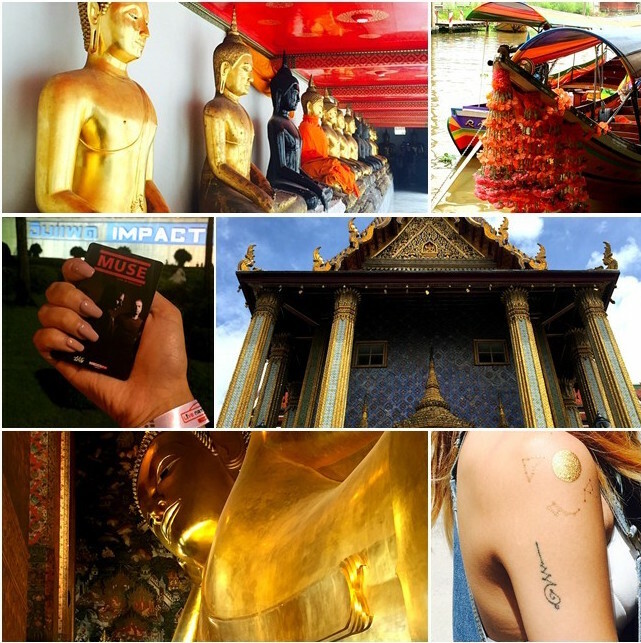 I think it's a brilliant place to start off, even though it's pretty intense because the centre of Bangkok is quite touristy, so there isn't too much of a culture shock. Khao San is the main tourist road; it's filled with street vendors, food stalls and bars/clubs. It can be pretty loud so only consider staying overnight there if you don't struggle to sleep. We visited The Grand Palace/Wat Phra Kaew (Emerald Buddha), Wat Pho (Reclining Buddha), Wat Mahatat and Wat Bang Phra. I also went to the Talin Chan floating market, a Muse gig at the Impact Arena and got a blessed Sak Yant bamboo tattoo by a monk. I would thoroughly encourage you to visit as many temples as you can early on, to submerge yourself in the culture in the early stages of your visit. The Grand Palace is the most expensive at around £10 but all of the temples are just as beautiful. If you are getting a Sak Yant at Wat Bang Phra, as advised - you may want to visit as early in the day as possible. However, I think this mainly applies to men. When I visited, it was early afternoon and I was seen to straight away. There were men praying on the floor beside another monk waiting for their turn but I was seen to by somebody else, so I assume there are separate monks for women. You pay about 70p for gifts for the monk, which you bow with and hand over. I have been told you can choose your tattoo from a list, ask the monk to choose one or bring one design of your own - which is what I did. I chose an Unalome which symbolises the path to enlightenment, which I felt was very appropriate for this trip to Thailand. The tattoo is comprised of many dots and was over in seconds, no more painful than a normal tattoo in my opinion. When shown, do not worry - the ink is a lot thicker immediately after it's been completed so it might look like a mess. I was terribly unhappy with mine at first, and had mentally already decided to tattoo over it when I returned to the UK but after a few days, the ink swelling had gone down and it revealed a gorgeous and delicate tattoo. Please also note that there is no scabbing after a bamboo tattoo, just swelling. Chiang Mai was a lot busier than I expected but I welcomed this with open arms and also enjoyed that the air was a lot fresher. The main area of Chiang Mai for travellers would be around the Tha Pae Gate where there are several markets spanning across many roads. I stayed in Chiang Mai for about 4 nights. We visited the Night Bazaar, Sunday Night Market, the Karen Long Neck Tribe, Elephant Carer Home and did a yoga class. I would recommend the Sunday Night Market over the Night Bazaar. The Sunday Night Market is bustling with life. The stalls are incredible, as is the food market and food stalls. It's busy but not overwhelmingly so and there is an abundance of talented musicians; one band performed an eerily accurate cover of Hotel California by Eagles...but they were all completely blind. The Karen Long Neck Tribe is worth a visit, but bear in mind it costs about £10 and isn't particularly big. A lot of their stalls are stocked with merchandise made in factories and aren't all handmade. It's not necessarily a self-sustainable village, as I didn't see any farms and I even saw a man ride in on a motorbike with takeout boxes! But it's interesting to see the women of the Karen Tribe and how they make the handmade goods they do sell. One woman told me it takes two days to make one of her scarves. When visiting, it's handy to have some toys with you to give to the children too. The treatment of elephants is a very sensitive subject in Thailand, particularly for westerners and it took me 3 days to find a good elephant sanctuary. I visited the Elephant Carer Home in the Mae Taeng area of Chiang Mai. They do not condone the use of chairs on an elephants back and do not chain the elephants up. They roam freely and can potentially join your lunch time picnic. You have the opportunity to feed them, ride them into the jungle and then bathe them in the river. They do not do any tricks like standing on back legs or painting any pictures. These seemingly impressive skills are actually the result of forced labour and abuse. Please make sure you visit the Elephant Carer Home and not those with similar names like Elephant Care Home or Elephant Care Centre. Sadly, on our way to the Elephant Carer Home, we passed an elephant with a double chair on its back and two grown adults. It was a sad sight to see. We were only in Patong, Phuket for 1 night but tried to make the most of our time there. We arrived in the evening so we decided to go for food and on to some bars. Bangla Road is the main strip for tourists with plenty bars and clubs. We visited Red Hot, Monsoon and White Room. Red Hot and Monsoon had a few live bands on, all incredible - they love their live music here! White Room is more of a club so expect to hear typical nightclub music. We also semi-regretfully visited Tiger Kingdom the next day. While the cubs we saw didn't appear to have had any medications administered to them, it seemed as though the adult tigers may have. I only saw one or two tigers that were active. I don't know what the natural habits are of tigers but for all of them to be asleep at noon, didn't seem natural at me at all. We did get to spend a lot of time with the cubs and happened to come at feeding time so we also had the bonus of feeding the cubs as well but for the price, it seemed morally quite disturbing and it upset me that the cubs we fed, would grow up to become these sleepy tigers kept in captivity. We stayed in the Phi Phi Islands for 2 nights and it was a dream; the people, the food, the atmosphere...everything. 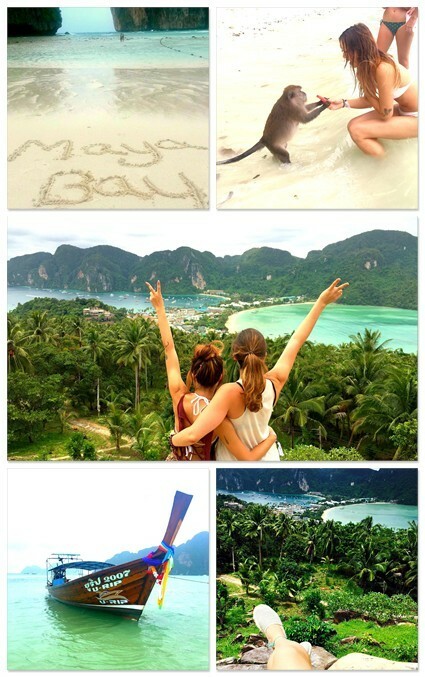 We climbed the viewpoint, went to Maya Bay and fed monkeys amongst other things. There were plenty of restaurants but we stuck to street food, sometimes eating in what appeared to be people's kitchens. I would also recommend going to Banana Bar which played all the best songs. The Viewpoint is really nothing to be concerned about, the trek up to the top is really not as bad as people make it out to be, you can do it in flip flops. However, the most difficult part is actually the trek to the start of the viewpoint trail because the steps are very steep. I would recommend booking a day trip on the island, we chose one that took us to Maya Bay where they filmed The Beach, Monkey Island and also included food and snorkelling. We thoroughly enjoyed this excision but would have enjoyed it even more had the weather been better. In fact, on our journey to and from Maya Bay, we all genuinely believed that we were going to die. The waves were coming in thick and fast and filling up our long-tail boat at a rapid pace; some of us were even screaming and telling the driver to turn around but he persisted. He is the master of the long-tail boat after all. In the end, this made for an unforgettable experience and a hilarious story. Koh Phangan was the perfect ending to my trip to Thailand, and what better way to end it than to go to a Full Moon Party. I wasn't sure whether I would love it or hate it but it was incredible. I stayed in Koh Phangan for 2 nights in total. The general consensus for the Full Moon Party is to drink buckets containing M150 which is a Thai version of Red Bull that can get you drunk pretty easily, and also to dress like a walking boho glow stick. The collective excitement for the party is infectious and as we were sharing a dorm with other girls, we all helped one another get ready. I also met someone from my block of flats in this dorm - small world! The Full Moon Party lasts until the music stops so about 9am and many people will stay to watch the sunrise. We actually sat and watched a bar called Sunrise...then proceeded to watch the actual sunrise. I was also very close to jumping into a flaming skipping rope until someone got set on fire. I would advise that you set a meeting point if any of your group gets lost, as we found with a new German friend we made after he lost all his companions and only managed to find at about 8am. Before heading back to Bangkok, I stayed at Charms Beach Resort for my last night in Koh Phangan and stayed in a treehouse with a hammock. It was utterly divine and something I had always wanted to do. I wouldn't however, recommend doing this if you have a suitcase as it's incredibly difficult to get up to the room. Flights - I had booked just less than two weeks prior to my departure and my indirect return ticket cost £414 in mid September. Internal flights were also cheap averaging at about £35, last minute. I flew with Thai Lion and Nok Air, Nok Air being notably impressive. My main airline was Etihad which is very similar to Emirates in terms of quality of flight, and price. Costs - Apart from the flight, most things in Thailand are extremely inexpensive. You can get a meal for 55p and visit the Grand Palace for a tenner. Transport to the airport might set you back £50 in the UK but is less than half the price in Thailand. The most expensive place I visited in Thailand was Phuket, and it wasn't extortionate - they were the same prices as the UK. Transport - I recommend getting a Tuk Tuk anywhere. They're fun, cheap and you can barter the price. There is an abundance of them means if someone won't accept your price, you can find someone who will. I also find it to be the epitome of Thai transport so it's also part of the culture. I would recommend getting internal flights if you are limited on time. Otherwise, I hear the night train is also a good experience. Weather - I was concerned about it being the 'wet season' but this really is nothing to be concerned about at all. When it rains, it's warm and refreshing and during my two weeks, only once was it a major downpour and it actually made for another one of my hilarious stories. I lost a flip flop in a flash flood and my contact lenses came out which sounds horrific at the time, but I arrived back to my accommodation soaked, to the sound of cheering. It's still very hot in the wet season, with the benefit of out-of-season prices for excursions etc. Language - If you have rough plans of what you want to do and see, try to learn how to pronounce the names accurately in case you are lost and need directions. Having it written on your phone means nothing to the Thai residents because what you're showing them is still using the English alphabet so they won't recognise what the words are either. This is especially important if you are out of the city centres where almost nobody speaks a word of English. Safety - It is relatively safe in Thailand, I found. But it's important to stay vigilant. I prefer to have my money on me as pick-pocketing doesn't seem to be a big issue. What we did find however was that money was taken out of a safety deposit box. Think of it this way, when you buy a safety deposit box or a padlock, you always get two keys so if you're given one key - who do you think has the other? Also, it's important to stay safe in terms of alcohol. In Phuket, a man came over to us to encourage us to drink our cocktail bucket. He came from behind us and held our straws for us to drink. It was completely out of the blue so we wondered if he had slipped something in our drink. Luckily, we spoke to the bar manager who kindly replaced our drink. Accommodation - Finding a place to stay is very easy and affordable. We used a mix of hostels, hotels and Airbnb accommodation. I stayed in some very basic places and also some amazing places such as the treehouse and on my final night before leaving Bangkok, I stayed in an African safari themed room in a B&B where every room was a different theme. Food - I love Thai food and food in general. I'm not a fussy eater and love spicy food, so sampling Thai cuisine for two weeks was perfect. The Thai love their spice so be sure to specify whether you want something weak or hot because if you don't specify, it will burn your face off. The coffee in Thailand is not great so opt for tea instead if you want a hot beverage. Also, as a general rule of thumb - make sure drinking water is purchased often especially for brushing teeth in the morning and evenings. 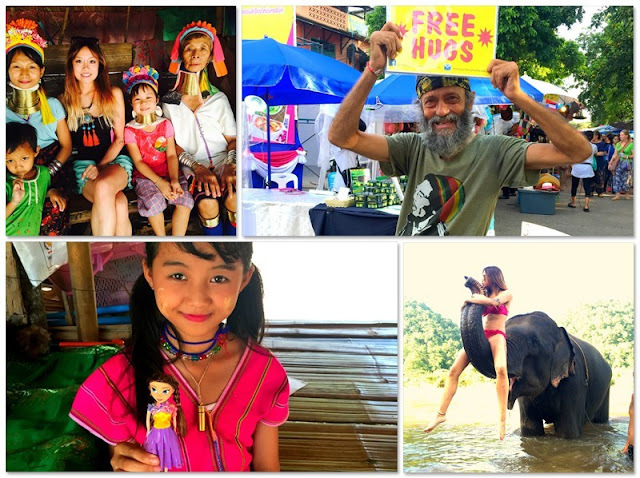 I had an unforgettable experience in Thailand, met the most incredible and inspiring people. My toxic relationship ended whilst I was on this trip, he was on holiday in America and found someone else which was a blessing in disguise for me, because little did I know it - I was free. After two years of mental instability, all my friends and family were relieved and happy for me. Something I had failed to see, was so obvious to others and it was painful for them to watch me lose a part of myself every day I was with him. This rescue mission was probably one of the best decisions I had ever made in my life. I was hurting, in all aspects of my life - I felt pain. It was hard to be grateful for what I had when it seemed like I was a prisoner in my own skin. I can't thank my friends and family enough, and especially the people I met on my trip. I was suffocating and now I can finally breathe.